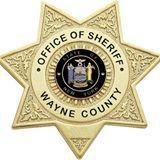 SODUS, N.Y. (AP & WXXI News) Authorities say two people have been fatally shot in Wayne County and police are searching for the suspect. WHEC-TV in Rochester reports that officials in say the shooting occurred Monday afternoon outside a home in the town of Sodus. Authorities say a man with a gun walked up to a car and shot a woman as she pulled out of her driveway. Officials say a man was then fatally shot nearby. The county sheriff's office has sent out a shelter in place alert advising residents to remain inside until further notice.